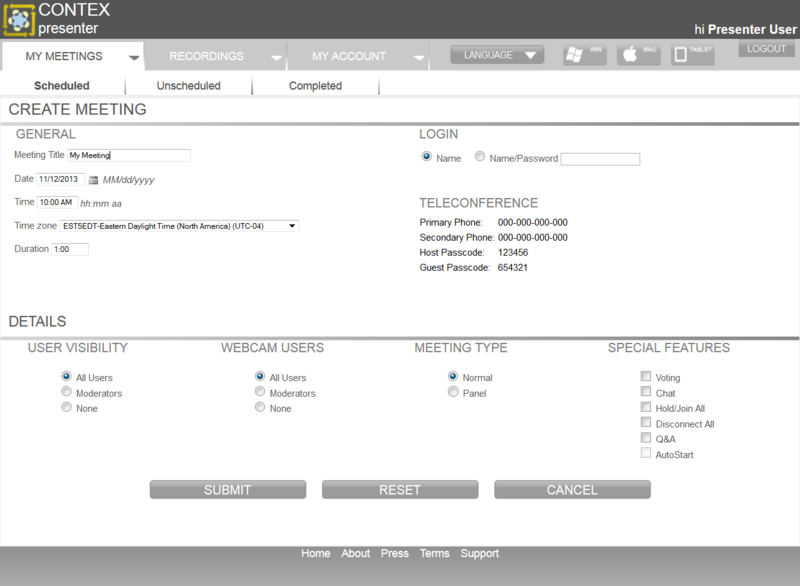 Simple, straight-forward, intuitive, and fully integrated Web conferencing. You need to work. You need to collaborate. Not later, but right now. CONTEX Presenter is the new Web-based group collaboration platform from Compunetix, and it allows your team to meet and share any digital content from anywhere, at any time. Today’s business climate requires productive collaboration beyond traditional audio-only conferencing. Data collaboration — the ability to share applications, desktops, and media between multiple users — is being demanded by all levels of professional teams. CONTEX Presenter is the cost-effective, accessible and scalable solution that enables collaboration with the robustness and simplicity inherent in every product of the CONTEX line. The intuitive design of CONTEX Presenter compliments the broad audio collaboration capabilities of a CONTEX media processor while providing end-users with a brandable and friendly groupware application. CONTEX Presenter is an intuitive online tool that combines the key elements of data, desktop, and application sharing. It also features integrated audio, text chat, and session recording in a simple application accessible from practically any internet-connected device. The full client can be downloaded and run on a client PC without any required installation. Supporting passcode secured connections, CONTEX Presenter makes it easy to provision users with audio/data collaboration that features common access codes as well as on-demand availability. With its automatic update functionality, users will always be utilizing the latest application version, making collaboration sessions simple, efficient, and immediately available. Because CONTEX Presenter is designed to work with the CONTEX family of media processors, it seamlessly integrates participant audio controls into the application. A data session can be easily linked to an existing audio conference directly from CONTEX Presenter. Audio features include a complete list of meeting participants with the ability to unify related audio and Web connections; the ability to play a roll-call, party count, and participant names; audio controls such as mute/unmute, call/disconnect, and hold/join; and the ability to start and stop session recordings at any time. CONTEX Presenter can be easily extended to incorporate and leverage the CONTEX system’s more advanced conferencing and collaboration features, giving your customers a truly powerful, flexible, and customizable collaboration experience. The CONTEX Presenter™ No Install Windows® client is also intended for Windows-based users, but requires no OS installation on the user machine. The application interface is delivered as a single, standalone executable file and can be launched and utilized in environments where new application installations are not allowed. The CONTEX Presenter™ Windows® client is the flagship client for the CONTEX Presenter web collaboration system. This fully functional collaboration client requires no further download and enables all aspects and features of the Presenter solution such as shared documents, desktops, and notes; high quality audio and video streams; text chat; white boarding, shared browsing; session recording and archiving; and access from anywhere. The CONTEX Presenter™ web client is a browser-based interface that provides access to the same Presenter system but without the need to download a separate client application. The interface exists and works within a variety of standard web browsers. CONTEX Presenter™ for Mac® is the full collaboration client for Apple® personal computers, including desktops and Macbooks®. This fully functional client requires no further download and is installable on any Apple OS computing system. This version is similar in functionality to the Presenter Windows client, and enables organizations to collaborate freely in mixed Windows/Apple OS environments. Want More Information on Presenter?